The Smithsonian’s National Portrait Gallery has announced the premiere of a newly commissioned painting of Julie Packard, a leading figure in science and ocean conservation and the executive director of the Monterey Bay Aquarium. The vividly colored portrait, by New York City-based artist Hope Gangloff, will first be displayed Tuesday, April 23, on the museum’s first floor. Packard is one of only a few ocean conservationists in the National Portrait Gallery’s ever-expanding collection and is the second woman figure in the field to be included. The National Portrait Gallery commission is curated by Brandon Brame Fortune, chief curator, and will remain on view through November 2020. 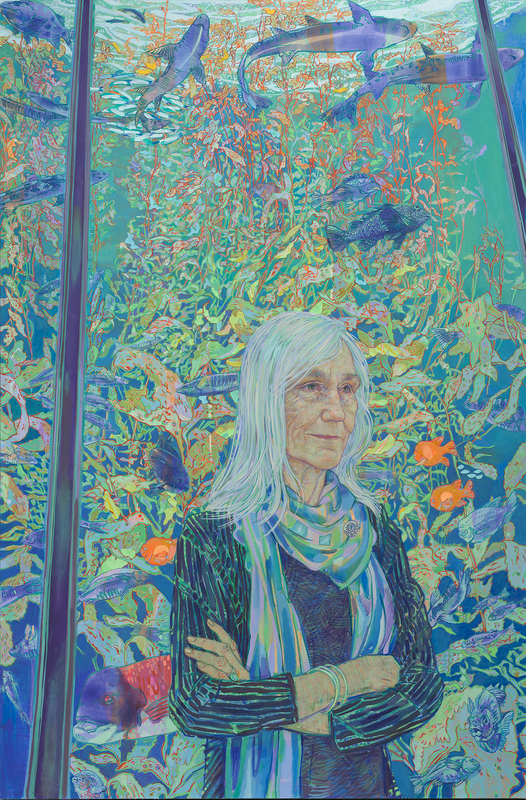 Inspired by Packard’s commitment to ocean conservation, the portrait was conceived during Gangloff’s visits to the Monterey Bay Aquarium in California. The design is reflective of the aquarium’s aquatic life and the artist’s affinity for large-scale canvases and bright color palettes. Packard is the founding executive director of the Monterey Bay Aquarium and has redefined aquariums as a force for conservation. Under her direction, the aquarium has expanded the public’s world view by bringing new marine life to light—from jellies to a living kelp forest, deep-sea animals to the open sea. Since the 1980s, the institution has developed as a leader of public engagement in the field of environmental science. Packard received the 1998 Audubon Medal for Conservation and the 2004 Ted Danson Ocean Hero Award from Oceana. In 2009, she was elected a Fellow of the American Academy of Arts and Sciences, and that same year, she was named a California Coastal Hero by the California Coastal Commission and Sunset magazine. Packard also served as a member of the Pew Oceans Commission, a diverse group of U.S. leaders charged with developing recommendations to improve ocean-resource management. On Tuesday, April 23, from 6–7 p.m., the Portrait Gallery will present a related public program, “Women Making Waves,” in the museum’s McEvoy Auditorium. The event will feature a conversation between Packard and geophysicist and president of the National Academy of Sciences of the United States, Marcia Kemper McNutt. Members of the public can register to attend the public program at npg.eventbright.com. This presentation is also part of the five-year Smithsonian American Women’s History Initiative, “Because of Her Story.” For more information, visit womenshistory.si.edu. Funding for the portrait and public program was provided by the Monterey Bay Aquarium Board of Trustees.